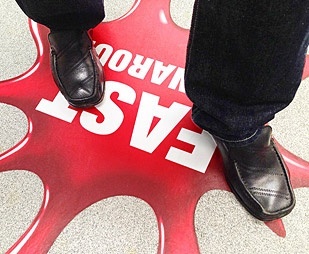 The ultimate in exhibition stand flexibility. 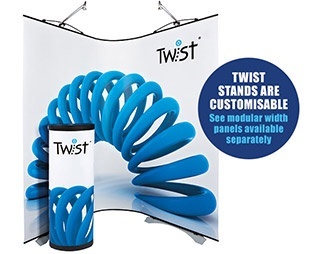 Developed to create virtually any stand shape you require using a slick looking system which is completely modular. The Pop up exhibition stands is the perfect display system. 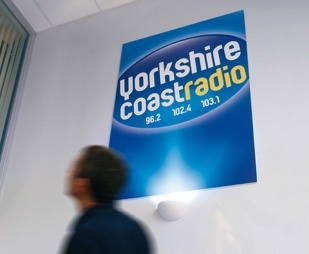 Personalised with full colour digitally printed panels, easy to set up and take down. 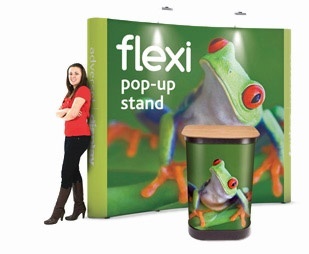 Pop up stand shown is a 3x3 pop up stand. 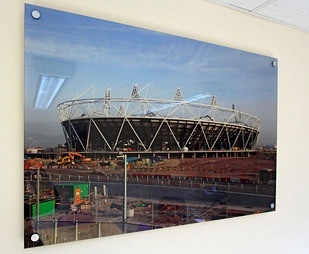 Brighten up your home or office space with quality 'clear as glass' acrylic display panels. Mounted with vibrant full colour prints, supplied with chrome studs/spacers for raised effect. Promote your products or event with vibrant display graphics on the exterior of your windows, but have a clear view from the inside, as if it were clear glass. Economical and durable printed display boards, produced to any bespoke size. 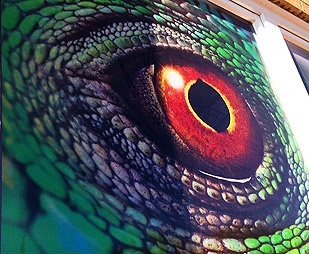 3mm -10mm Foamex available for indoor & outdoor display. Matt or gloss laminated. 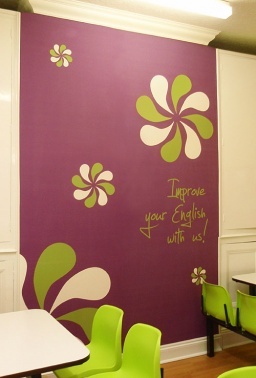 Printed on durable 500gsm PVC, hemmed & eyeletted. Guaranteed against fade for 4 years. Fantastic quality at prices which are hard to beat, offering 24-hour affordable advertising. Ever wondered what to do with that blank piece of brick or breeze block wall? 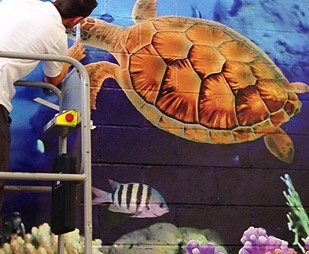 Why not cover it with a favourite image or design? Printed vinyl that heats into the wall texture. Complete with built-in anti-skid laminate, with a 6-month Health & Safety compliance guarantee. Ideal for offices, retail & exhibitions. Digitally cut to any shape. Digitally printed posters, vibrant colourfast inks, guaranteed against fade for 4 years. Fantastic prices. Standard large format sizes or custom sizes. Ideal for billboarding, hanging or poster framing. 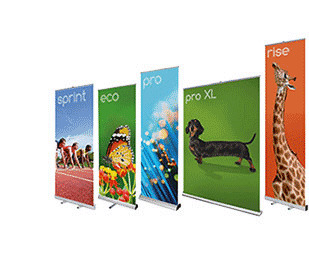 Wide range of high impact roll-up banners, 800mm up to 1.5m widths, to suit every budget. Our roll up banner printing service includes full testing of every product. Zip carry bag with every stand. 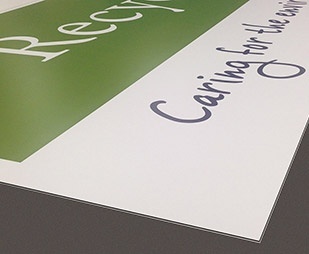 Perfect for exterior shop signage or advertising display boards, made from quality Aluminium deposit material. Dibond Aluminium Signs & Boards...from £39per sq.m. Frosted Window Vinyl Graphics...from £26sq.m. Backlit Poster Film...from £25per sq.m. Custom Size Vinyl Banners...from £14per sq.m. 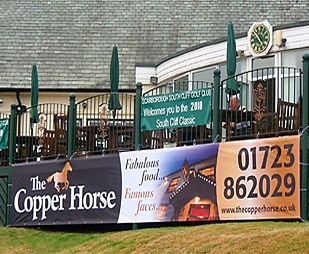 Custom Size Mesh Banners...from £18per sq.m. Foamex Signs & Boards...from £23per sq.m. We offer online quoting and ordering for all large format printing projects. Our on-line pricing and printing service offers you great value and gives you the flexibility to get large format digital prices and printing on demand. Please contact us should you need any help ordering, or if you would like to request an account with Adverset. Our high-tech printers provide a non-fade guarantee of up to 5 years, offering INDOOR and OUTDOOR weatherproof usage. Adverset Sponsors Colour the Coast 2017! A Gold Horse for the Plough!